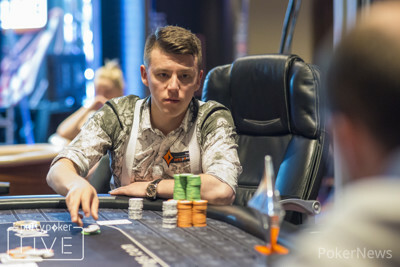 It took an additional third and final day of poker to crown a winner of the 2017 partypoker LIVE Million Germany €2,200 High Roller, but ultimately it was none other than Russian partypoker Ambassador Anatoly Filatov who emerged victorious after a quick yet volatile heads-up battle with Andre Haneberg. Before the duo went toe to toe at the poker felt, a three-way deal was struck with Aleksandar Tomovic, and thus the winner's cheque ended up being for €42,000 instead of the original outlined €60,000 first prize. 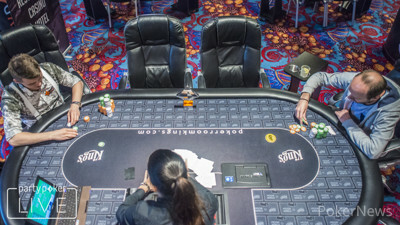 Six players out of a 100-entry strong field returned to the tables on the unexpected Day 3 at the King's Casino Rozvadov 11 hours after the players bagged and tagged for the night to end Day 2. When play resumed at midday it was with Filatov holding a narrow lead over Aleksandar Tomovic and Boris Kotleba with Hoa Bui Chi assuming the role of a short stack with a mere 11 big blinds. 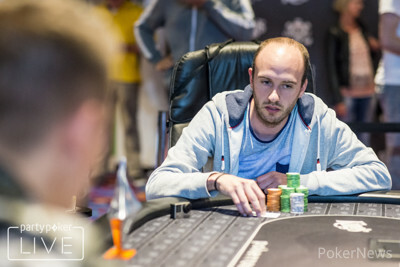 Despite coming into the final day with the third biggest stack of the bunch, it was Kotleba who became the first casualty of the day after no more than 30 minutes of play. Kotleba lost a big one to Filatov early on when his second pair was no good against the top pair of Filatov, and shortly after he doubled up German Andre Haneberg when he failed to make a straight holding nine-ten all-in against a top pair on a jack-eight-four flop. The final nail in the coffin came when Poland's Kacper Pyzara shortly after managed to make a better flush holding queen-jack against Kotleba's king-ten, and Kotleba hit the rail in sixth place. The very next level witnessed Hoa Bui Chi fall victim to Haneberg when nothing materialized for his queen-ten suited on the flop, turn or river, and Haneberg scored the knock-out with his ace-deuce. Despite holding the chip lead for a short while, Pyzara was the next to leave the final table. Pyzara handed over most of his stack to Filatov after running into a rivered flush, and shortly after he put his remaining big blinds in with ten-eight, but didn't get there against the king-nine of Tomovic. Going into the first and only break of the day, the remaining three players held virtually even stacks, and that lead to a deal being struck between Filatov, Tomovic and Haneberg securing each of them a payday of €39,000 and leaving the trophy and €3,000 for the eventual winner. It took quite the bad beat for Tomovic to be eliminated next. Tomovic got it all-in with pocket kings against the pocket queens of Haneberg, but a queen on the flop decimated the stack of the Slovak, and he exited shortly after getting it in with a dominated king against Filatov. The heads-up battle was both fast-paced and swingy. Filatov started out taking a commanding lead when he rivered two pair, but not ten minutes later Haneberg pulled it back by check-raising all-in on the turn in one of the biggest pots of the tournament. Filatov jumped ahead once more after doubling with pocket tens against the king-five suited of Haneberg, and ultimately it took a classic coin flip to decide the winner, when Filatov moved in with ten-nine and Haneberg called it off with pocket treys. 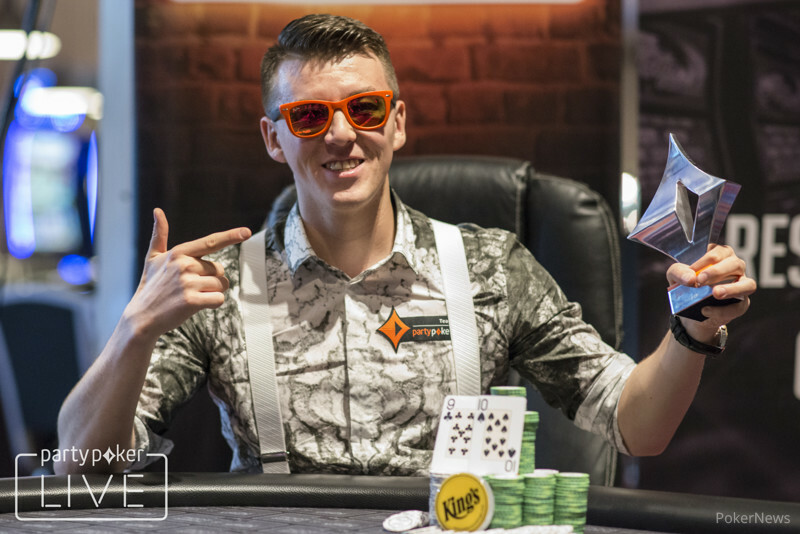 A ten on the flop sealed the deal, and that brought the first flagship event of the festival at the King's Casino to an end with Filatov lifting the trophy. The PokerNews live reporting team will continue to provide all the action from the festival as the €1,000,000 guaranteed Main Event will play out in the coming days. Andre Haneberg never regained momentum after doubling Anatoly Filatov, and he called off hist last 2.1 million chips when he found in the big blind after Filatov had put him all-in. Filatov had overcards with and took a commanding lead on the flop. The on the turn changed nothing, and Haneberg was left drawing to one of the remaining treys in the deck. 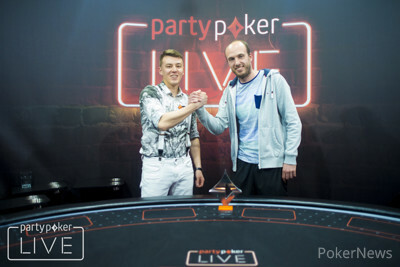 It wasn't to be for the German, as the rolled off on the river, and Haneberg and Filatov stood up and shook hands before the partypoker Ambassador grabbed the trophy standing between them on the table and lifted it triumphantly in the air. 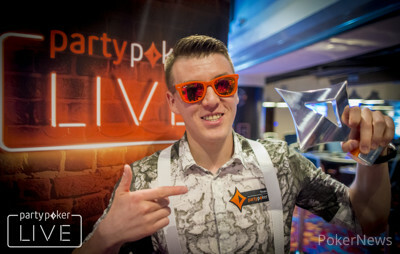 Andre Haneberg has to be content with a second-place finish good for €39,000 while Anatoly Filatov is your 2017 partypoker LIVE Million Germany High Roller champion and takes home €42,000. A recap of today's action will be up shortly. Andre Haneberg made it 360,000 to go from the button, and Anatoly Filatov reraised to 800,000 from the big blind. With action back on Haneberg, he announced all-in and Filatov wasted no time making the call. Both players stood up bot eventually got back in their seats as the board ran out and the Russian partypoker Ambassador scored the double. Despite getting off to a bad start, Andre Haneberg has managed to pull it right back thanks to a couple of pots. The biggest came when he check-raised a flop to 810,000 and check-raised all-in after Filatov fired 700,000 on the turn. Filatov made the snap-fold, and Haneberg is right back in it. Anatoly Filatov raised preflop and followed up with another bet on the flop. Haneberg made the call both times. The peeled off on the turn and Haneberg check-called once more, this time 620,000. On the river Haneberg checked a third time, and Filatov pulled out a massive 1.8 million chips from his stack and slid them over the betting line. Haneberg thought for a minute before announcing the call, but he couldn't beat Filatov's , and the Russian partypoker Ambassador took the pot and a commanding lead. The players are now dead-even after Andre Haneberg drew first blood in the heads-up duel. With 900,000 already in the pot, Haneberg fired 380,000 on a board of . Filatov called but folded to another bullet of 735,000 on the river. "We are even now," Filatov said after the pot was shipped to Haneberg. "Wanna chop the 3K?" Haneberg asked with a grin on his face. "No, let's play," a determined Filatov responded, and play continued. The tournament clock has been restarted with four minutes left of level 26 and blinds of 60,000-120,000 and a running ante of 20,000. Anatoly Filatov is currently in the lead, and he will be looking to secure a much-anticipated high roller win. "I have so many secondary results, I want the win," Filatov declared in the short break before heads-up play, but he will have to take down a well-playing Andre Haneberg to get there.